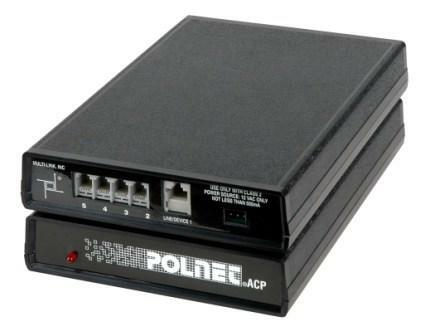 The Polnet ACP is an industrial grade line sharing device (1x3,5,9) that actively and accurately answers, screens, and routes all voice, fax, and modem calls to the right equipment eliminating the need for costly dedicated phone lines. The ACP is similar to The Stick in operation but has additional security and programming features that make it ideal for IT applications and critical data acquisition. The ACP is available in 3, 5, and 9 device port configurations. Special features include priority call over-ride (port#1), remote programmability, user defined seven digit transfer codes, and dual surge protection. The ACP works on a standard POTS line and answers inbound calls at the first sign of ring voltage. After the phone line switch goes off-hook, it immediately screens for CNG (fax) and DTMF transfer codes. During this processing period, a "ring back" tone is issued to the calling party. Once a transfer command is received, the call is routed to the corresponding port. In the absence of fax/transfer codes, the call is defaulted to the voice port. Outbound calls are processed in the normal fashion with barge-in protection. Priority call over-ride can allow a device on port #1 to interrupt any transmission for outbound call. Remote programmability is achieved via DTMF pass code issued by calling party. Polnet is an Industrial Grade Automatic Call Processor that eliminates dedicated phone lines by expanding the number of devices you can connect to a single line. Use the Polnet for modems, data and credit card terminals, storage and monitor systems, and more! This Modem Sharing Device has special polling features and interfaces with an rj-31x jack or T-Adaptor used for larger phone systems. Able to poll multiple devices (modems) in a single call. Typically used in multiple location (store) applications.